But what about that last modified value? Well, that on the SQL side would the values of now() but the MySQL NoSQL side does not have that concept, at least it is not documented. And lastModified is not in the document itself?!?! Is it metadata hiding somewhere and hiding somewhere in the Mongo documentation?? Well, after some frustration with searching for document metadata and timestamps with Mongo documents, I decided to circle back to this later. So both do what is wanted but have much different syntax. Mongo will update only one record unless multi is set to true. If not set you will get only one record updated. MySQL has no such limitation and will change multiple records. I am also a fan of the explicit and in the MySQL query and not much of a fan of the implied and in the Mongo query. Why? When you try to debug things at two in the morning it is very easy to assume an or or other comparison operator. When you program assembler you get picky about things like or, xor, and ands. You get the _id if you want it or not. MySQL only gives you the desired values for the specified keys. So those extra characters are not so bothersome with small data sets but when you have millions of lines or more that extra really add overhead. 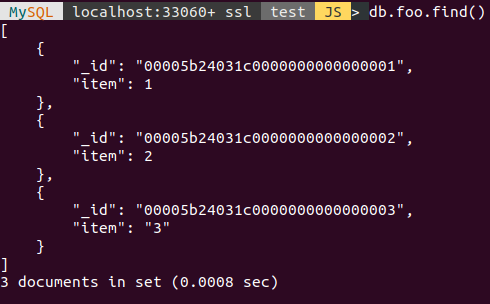 Our test data in the MySQL Document Store with the values of 1, 2, and "3"
Mongo's reference manual under db.collection.find informs us that 'comparison operators only perform comparisons on documents where the BSON type of the target field matches the type of the query operand.' and silly me was trying to compare a numeric to a string. Now you can enforce data types in a Mongo collection by using schema validation. But I thought the beauty of schema less data was that you did not have to normalize the data. Am I picking nits? Well, I have been pushing data around in computers for close to four decades now and wish I had a nickel (or other small coin of similar value in another curency) for every time I had to 'wash' my data to switch it from Type X to Type Y or reshuffle dates or even add/remove thousands separators. To me schema less means that "3" and 3 are equal. At least until they are cast to a type. I have been getting some very good feedback on this subject and will delve into this more. Switching to Python mode, a simple program reads the data from a file and loads the collection. We can quickly look at all the restaurants but it may be easier to start out looking at the types of cuisine. And it would be nice to see the numbers of each type. The big surprise for me was the 1,011 other restaurants after seeing a rather inclusive list of cuisine styles. What cuisine types are available and their numbers? So lets narrow our search down and look for some Cajun food. But since we are health conscious we will want to check the health department ratings on the restaurants. And we can see the names of the restaurants with their latest health department grades. We need to create a new collection named zip in the schema we just created and then switch to Python mode to read in the data line by line and store it as a document in the zip collection. You might want to go back and read the wonderful presentation and scripts by Giuseppe Maxia on loading MongoDB data into MySQL at https://github.com/datacharmer/mysql-document-store as he originated this very useful bit of code. One thing that helps is that this data set has a _id field that the MySQL Document Store will grab and use as the InnoDB primary key. I will have to brush up on my Python to extract another value from data sets to use for the _id field. And we can now perform NoSQL searches on the data. 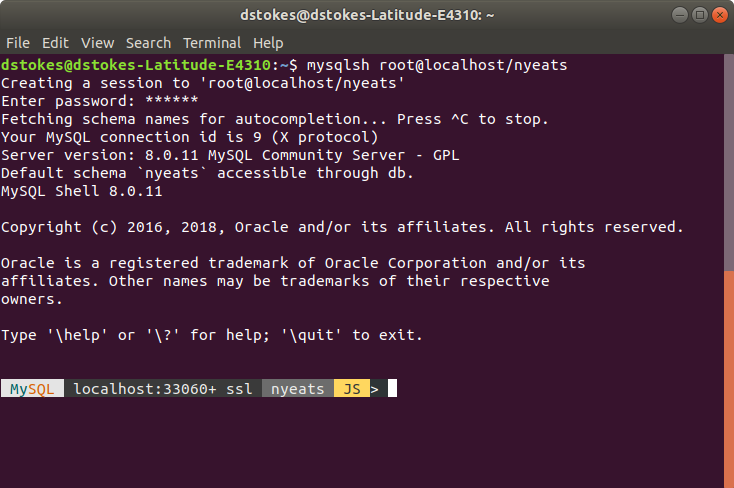 If you have questions about porting data from MongoDB into the MySQL Document Store or the Document Store in general, please drop me a line. 9am 20 years of MySQL, 20 years of PHP, and 10 Years of SELF -- What the heck has been going on? 1:30 MySQL Without the SQL -- Oh My! 11:30 The MySQL Ecosystem - Understanding It, Not Running Away From It! !